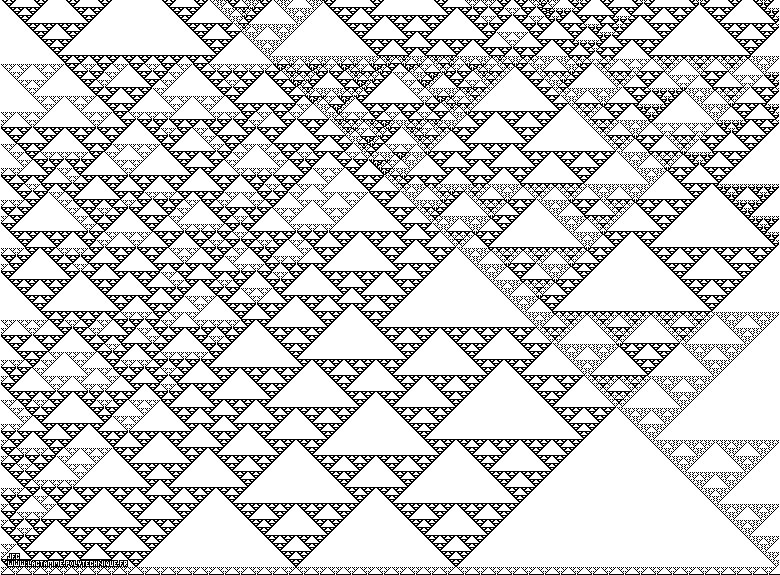 An elementary monodimensional binary cellular automaton -90- with 49 white starting points -on the bottom line- [Un automate cellulaire binaire monodimensionnel élémentaire -90- avec 49 points de départ blancs -sur la ligne du bas-]. An elementary monodimensional binary automaton is a monodimensional set of cells. At time 't', each cell (with coordinate 'x') has a value 'CELL(x,t)' that equals either 0 (Black) or 1 (White) and has two neighbours (one at its left 'CELL(x-1,t)' and one at its right 'CELL(x+1,t)'). The points outside the picture (at left and at right) are assumed to be White. The time evolution of this set of cells is defined by means of rules. By the way there are 256 different such elementary monodimensional binary cellular automata (see and ). The vertical axis is the time axis and the initial conditions are displayed on the bottom line.